It’s February, the heart of the grey Vancouver weather. It’s not fresh and new like January, or Christmassy like December. It’s just February. Not quite spring yet and on the down swing of winter. I try to keep up beat in February, I mean, wet weather means cozy knitting time in doors right? Sure February has Valentines day to spice things up, and the Olympics will offer a nice distraction, but the fact of the matter is February means grey and wet. Depressed yet? There’s hope. Hope in the form of a lovely sweater. 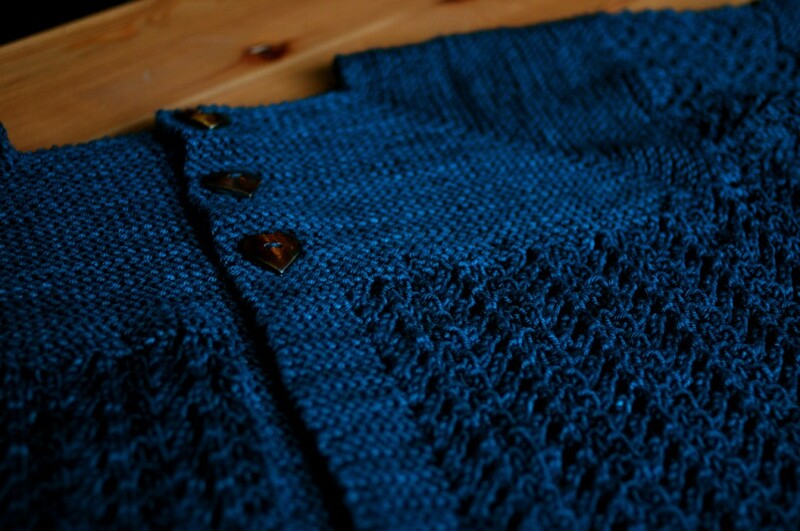 I just finished up the beautiful February Lady sweater. It’s a pretty pattern adapted from one of Elizabeth Zimmerman’s patterns, the Baby Sweater on 2 Needles. The sweater is knit from the top down which is great for trying things on as you go. The pattern is perfectly customizable which is always a good thing. Short sleeve, long sleeve, swingy, conforming, whatever you want, you can do! This sweater has been popular around the shop too. The lovely Jessica, up in North Van, knit up a February lady last year with the gang at knit nights. Emily also knit up a February lady but she modified hers quite a bit (I’m not surprised). I started working on mine in December but I had to ask myself why I was asking for so much trouble knitting un-gift related items in December. The sweater got put away but I pulled it back out in January and it’s already finito! I used the ever popular (can you feel an obsession forming?) Sweetgeorgia Superwash Worsted in colour Riptide. I kind of want to decorate my entire house in this colour, it’s like a teal/navy/black kind of combination. Love it. 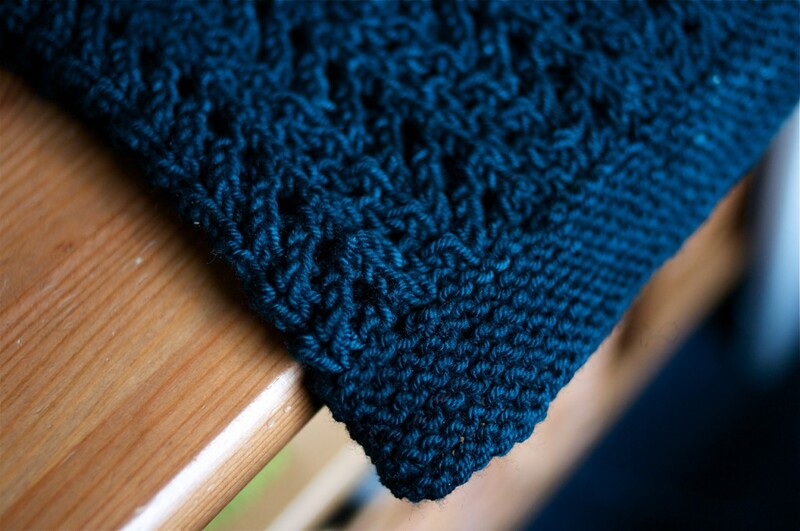 The yarn is quite sproingy which I quite like in this pattern. 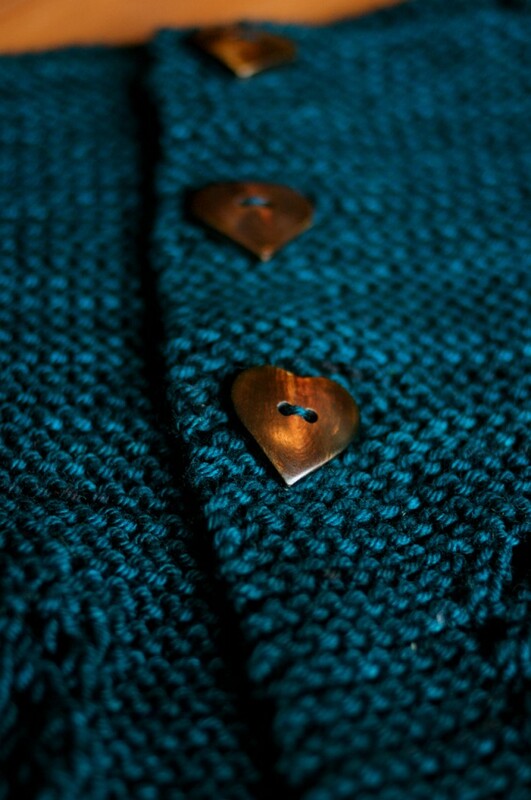 Buttons: You will need 3 or more buttons for this sweater. You can use any size, just match them to your buttonhole sizes. Notions: Stitch markers were very helpful in this pattern. 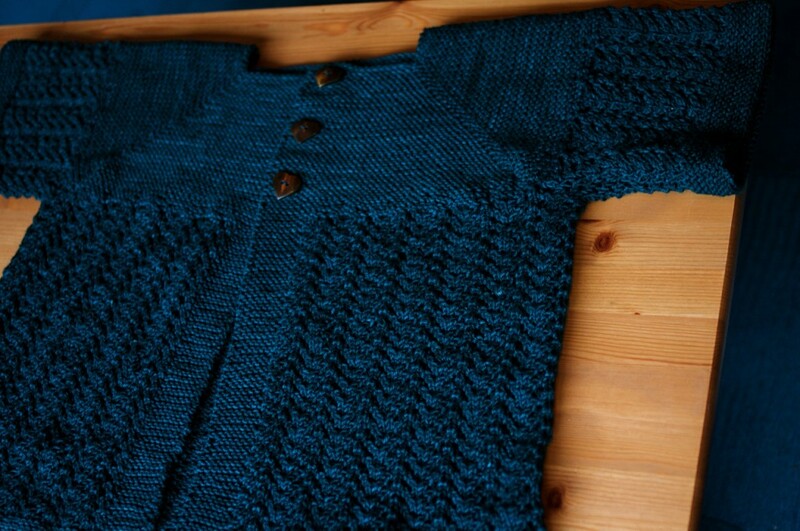 You will also need a little waste yarn to hold the sleeves. Pattern: Free on Ravelry here. This entry was posted on Monday, February 1st, 2010 at 9:32 pm	and is filed under Uncategorized. You can follow any responses to this entry through the RSS 2.0 feed. Both comments and pings are currently closed.